One size, but it can be easily customized. Shizuku means drops or tear-drop shape in Japanese. 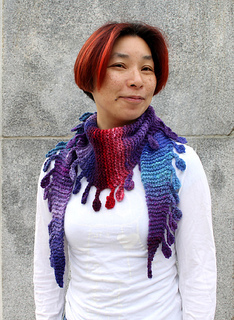 This scarf is knit from side to side with the droplets knitted along one side. The droplets are made with short row shaping. 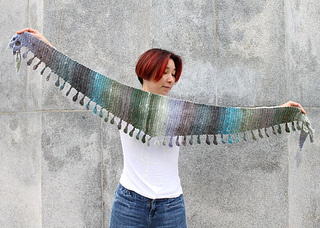 The samples are made with with 2 skeins of Noro Kureyon, but you can substitute any yarn with the same weight. 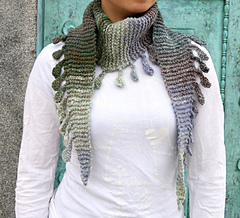 I have included instructions on how to make the scarf larger/longer if desired. 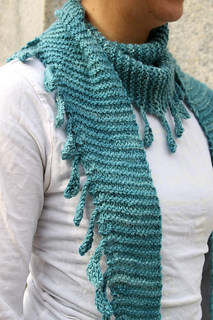 You will need more than 220 yards of yarn if you are going to make the scarf longer.